Last week, I wrote about trying to be more social within the quilting community. One big thing I decided to do is join Quiltville's mystery quiltalong. I got off to a late start so this week I worked on both clues 1 and 2. 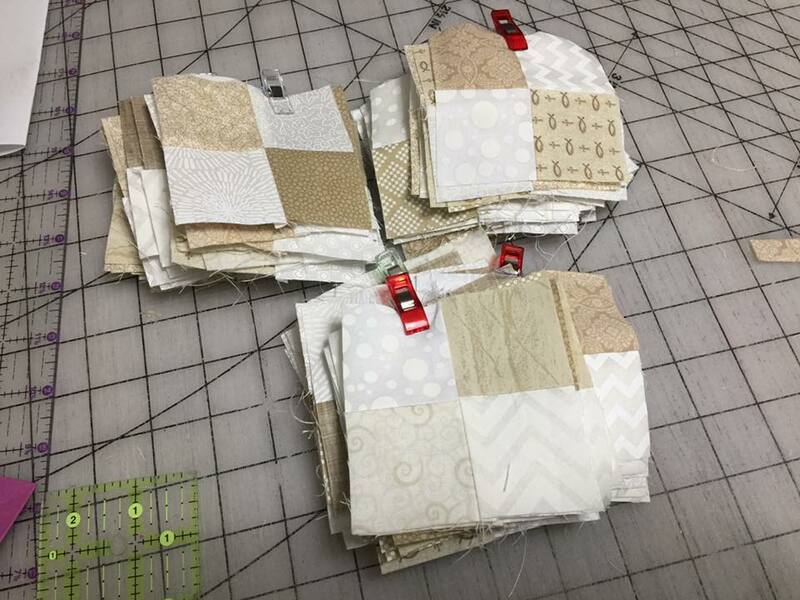 I went a little nuts with cutting strips, especially because I'm only making the small version of the quilt. So my lesson here is to cut fewer strips at a time because future clue will likely require strips of a different width. I don't use creams a lot, so I only bought 1/3" yard cuts. Everything else is from my stash. 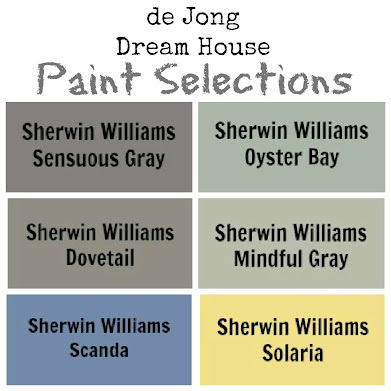 I figure I will stick to whites for my other neutral clues. Because I needed 100 four patches, I did a lot of chain piecing, which gave a reason to use one of my favorite gadgets: the Thread Cutterz. 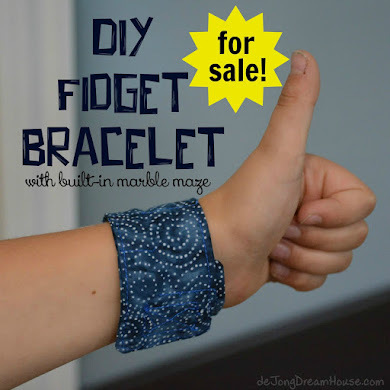 I bought mine at a quilt show this summer. 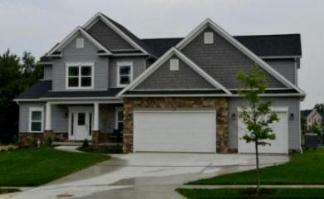 The inventor originally made it for fishers to cut line, but quilters got ahold of it, and now he has a second market. 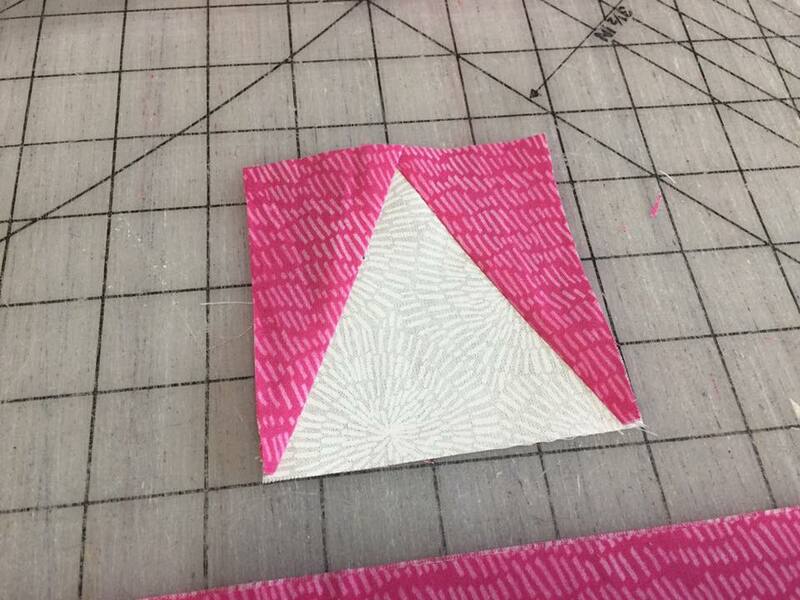 Something fun I learned during this clue is how to "spin" my seams to create flatter blocks. And before I knew it, clue 1 was complete! 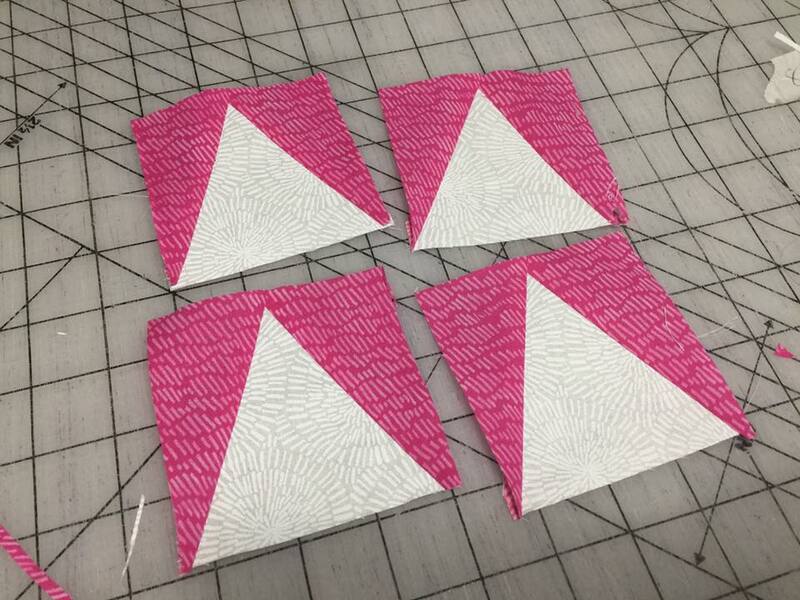 Clue #2: 50 neutral triangles in magenta square#2. On to Clue #2. 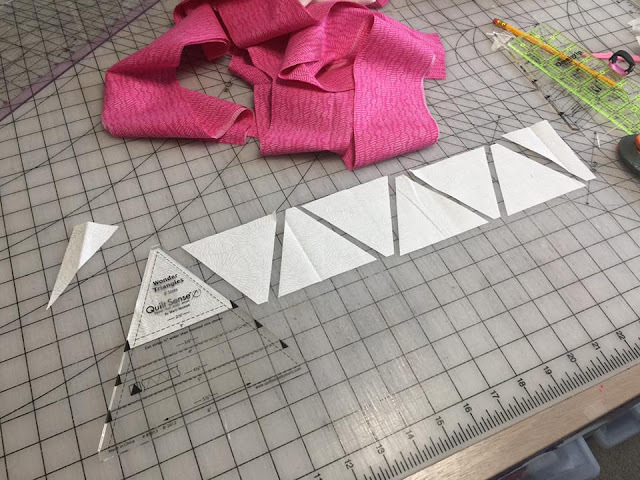 I was feeling pretty good when I remember that I already bought a square in a triangle ruler set awhile back because an equilateral triangle quilt is in my queue. My son woke me up too early Sunday so I decided to do a little sewing before church. I'm itching to start my OMG goal quilt, but wanted to knock out clue #2 first. I cut strips according to the instructions and started cutting. I learned my lesson to make a few at a time. I got a little confused when I got to cutting the magenta strip. First of all, the ruler seemed backwards, but it had to be that way to get the right angle. 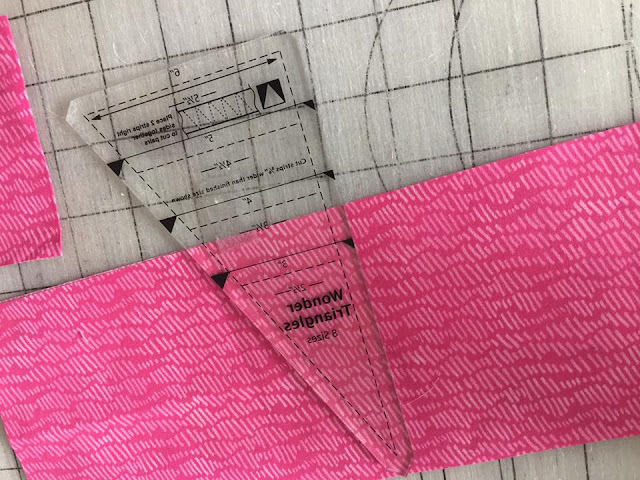 After four attempt that didn't work, I realized that with this ruler I have to cut the square strips 5/8" wider than then triangle strips. After I made the adjustment, I finally had one completed unit! It didn't take long to complete the other 3 units from my first strips. Now that I knew what I was doing, I was feeling pretty confident that I could complete the other 46 quickly...until I sliced through my finger. 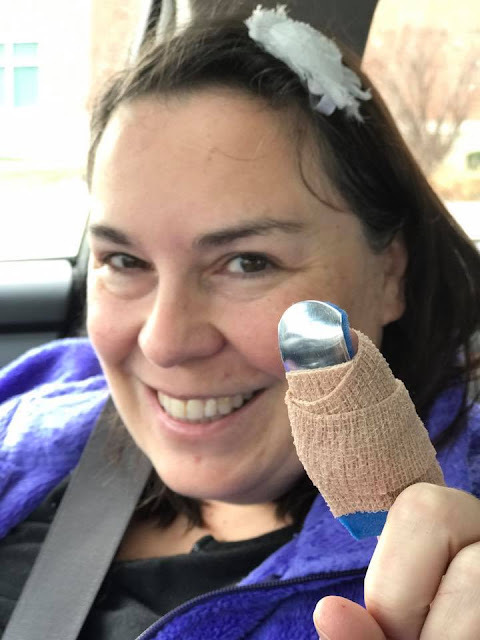 The doc said no sewing this week, so I will have to have to enjoy everyone else's pictures, and maybe catch up on some blog posts this week, though typing is a bit of a challenge with my big ol' wrapped finger. After the ER, my boys took me to ALDI to get the last of our goodies for Sinterklaas. 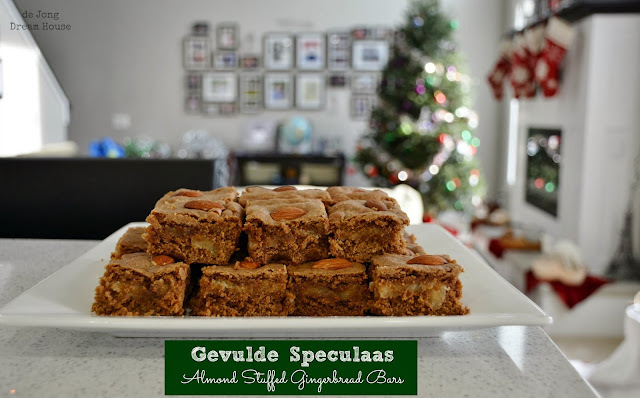 I made homemade gevulde speculaas (stuffed gingerbread) for our son's class. Since our ALDI is close to Joann, I asked if we could stop in to see if they had the ruler set Bonnie recommended. Not only did they have one set left, but it was 40% off! I bought it because when I looked at it, I saw how it was better than the one I had at home. Here you can see the triangle pieces aren't very different, but the Tri Tool is more clearly marked. The real difference can be seen on the "square" pieces. 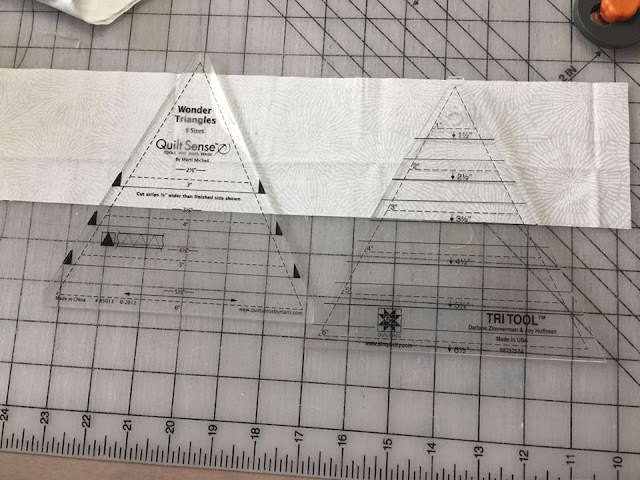 The Tri Tool uses strips the same size as the triangle. The Quilt Sense ruler strips need to be 5/8" wider. And again, the markings on the Tri Tool are easier to read and understand. Looking at the tips, you can see the main difference, and how I was able to slice my finger so deeply. With the QuiltSense Ruler, I used my rotary cutter to trim that small angled bit. 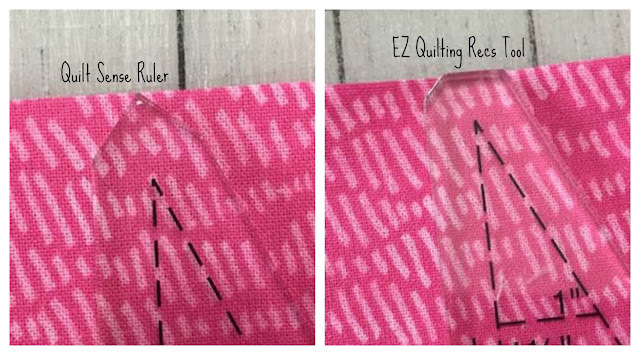 With the EZ Quilting Recs Tool, I only make straight cuts. Guess which one I will be using from now on? Bonnie promised we'd learn a lot through this quilt along. So far, I'd say that's true. Hopefully the future clues will be a lot less painful! Beautiful blocks. Amazing how some tools are so much better than others. I feel sometimes that the folks making the tool have never actually pieced with them. Or at least not very much. I like the ring cutter thingie. Do you get it at a sporting goods store? I was really surprised by the difference. 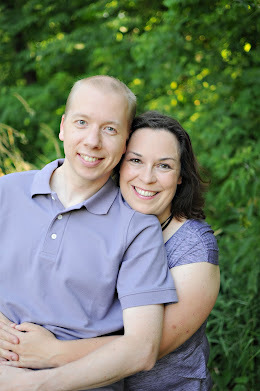 I look forward to working with the new one next week. I bought my thread cutterz at a quilt show. you can get one at Amazon here: http://amzn.to/2h0ahgf. if you go to a sporting goods store, look for it as line cutterz. Ouch, ouch, ouch. Too many lessons in one step. What you have done is very pretty, though. I'm so sorry you cut your finger. 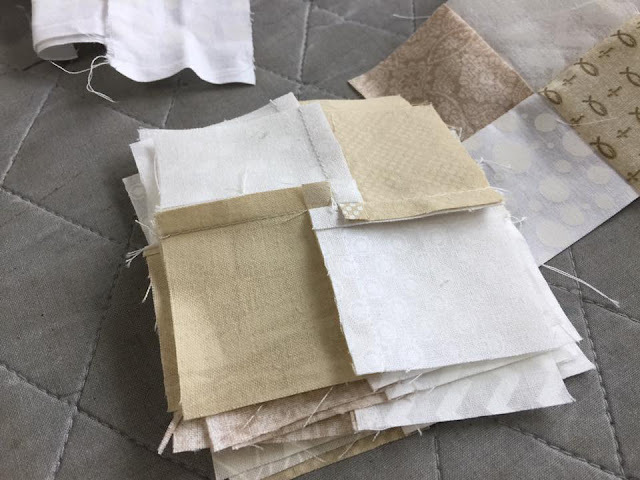 There's nothing worse than wanting to sew, having time to sew, having your quilting mojo on, and then being unable to sew. I cut a corner tip of my index finger off with a rotary cutter once time. It healed up fine but it's still sensitive. 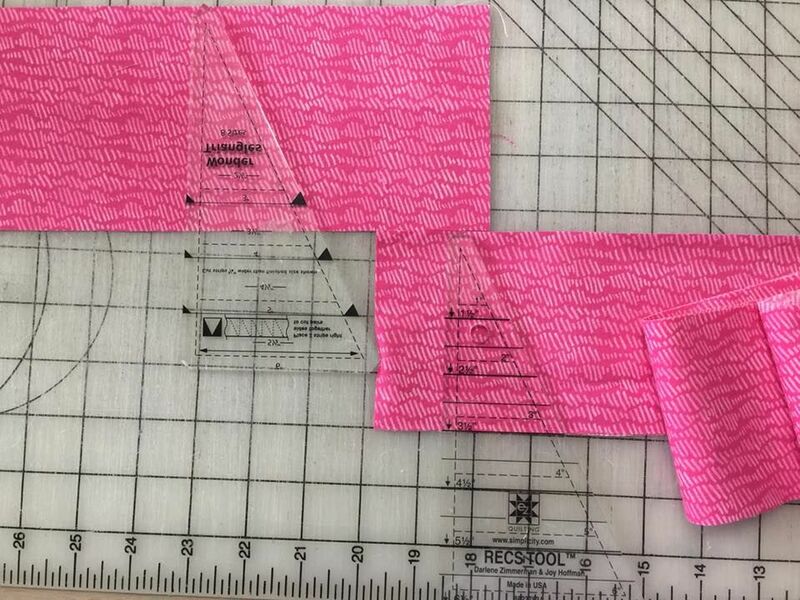 I learned that I don't do rotary cutting when I'm sewing at my friends house. 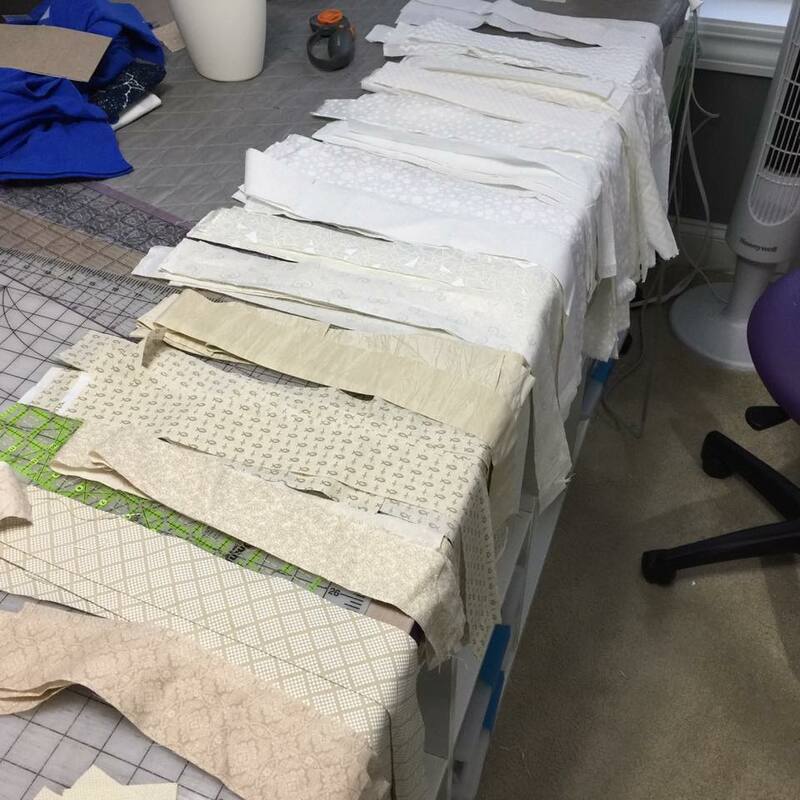 I can cut with scissors, I can hand sew, I can applique, or machine sew but I leave my rotary cutter home. Best wishes to you! Boy, you aren't kidding! I sliced the tip of my finger two years ago. I had that glued. this one hurts much worse. hopefully the pain will lessen as it starts to heal. More time to watch Christmas movies!! Hope your finger heals fast! Your mystery units look lovely. Oh no! Quilting is a dangerous sport! Hope it heals quickly!